Financial Reporting Standard (FRS) 116, and the Singapore equivalent – Singapore Financial Reporting Standard (International) (SFRS(I)) 16 Leases – replaces FRS 17 Leases for financial year periods beginning on or after 1 January 2019. In view of this, the Inland Revenue Authority of Singapore (IRAS) examined the income tax implications that would arise from entities adopting FRS 116. It issued an IRAS Public Consultation Paper setting out its propositions on 8 August 2017 to seek public comments by 28 August 2017. Thereafter, IRAS issued an IRAS e-Tax Guide on the “Tax Treatment Arising from Adoption of FRS 116 or SFRS(I) 16 Leases” on 8 October 2018. This article serves to recap key changes to the leases accounting standard and identify the tax treatment post-FRS 116/SFRS(I) 16 adoption. Under FRS 17, a lessee had to classify whether a lease arrangement is a finance lease (FL) or operating lease (OL). FRS 17 paragraph 4 defines an FL as “a lease that transfers substantially all the risks and rewards incidental to ownership of an asset. Title may or may not eventually be transferred”, and an OL as “a lease other than a finance lease”. The accounting under an OL and FL by a lessee will give rise to different financial statement effects. However, under FRS 116, where a lease arrangement exists, the lessee no longer does the OL/FL classification. Instead, FRS 116 requires a lessee to recognise assets and liabilities for all leases with a term of more than 12 months, unless the underlying asset is of low value. A lessee is required to recognise a right-of-use (ROU) asset representing its right to use the underlying leased asset and a lease liability representing its obligation to make lease payments” (ASC, 2018, FRS 116 para IN10). Lessees “recognise depreciation of lease assets and interest on lease liabilities in the income statement over the lease term, and separate the total amount of cash paid into a principal portion (presented within financing activities) and interest (typically presented within either operating or financing activities) in the cash flow statement”. In other words, there is a dual lessee accounting model under FRS 17 but a single lessee accounting model under FRS 116. The current tax treatment of leases under FRS 17 for a lessee is as follows. The tax preparer will have to assess whether the lease arrangement meets the definition of an OL/FL under Section 10D(3) of the Income Tax Act (ITA). Under Section 10D(3), FL “means a lease of any machinery or plant (including any arrangement or agreement in connection with the lease) which has the effect of transferring substantially the obsolescence, risks or rewards incidental to ownership of such machinery or plant to the lessee”, and OL means the leasing of any machinery or plant, other than finance leasing. It is interesting to note that both the ITA and FRS 17 use the concept of significant transfer of risks and rewards in defining FL and OL. There are three potential tax treatment scenarios. 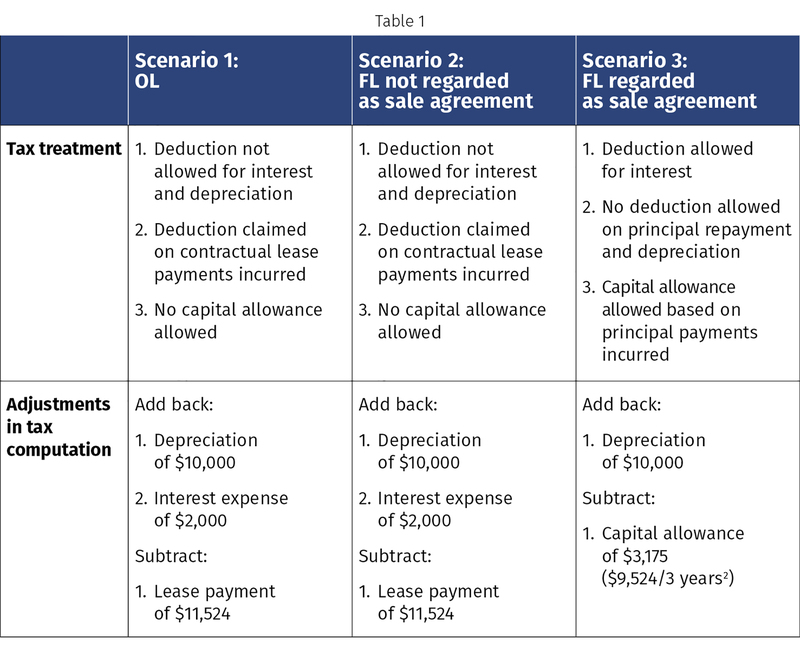 In the first scenario, if the lease is an OL, then “lessee is allowed to claim the contractual lease payments as deductions against his income in the basis period in which such payments are incurred, provided the lease expenses are wholly and exclusively incurred in the production of income”. No capital allowance is allowed on the leased asset. After the entity establishes that it is an FL, the tax preparer has to assess whether the FL satisfies any of the paragraphs (a) to (e)1 of Regulation 4(1) of Section 10D Regulations. Where none of the paragraphs is satisfied, then the FL is not regarded as a sale agreement. This is the second scenario. The lessee is then allowed a deduction on the full amount of lease payments comprising the interest and principal repayment. 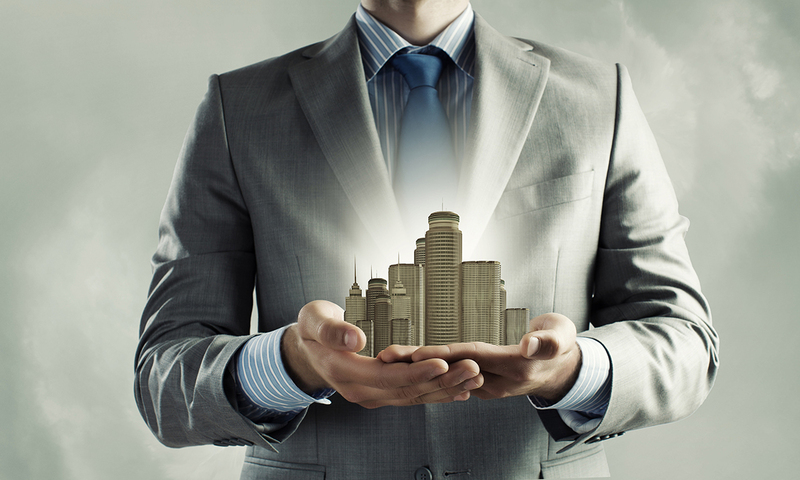 No capital allowance in respect of the leased asset will be granted to the lessee. If any of the paragraphs is satisfied, then an FL shall be regarded as a sale agreement. In this third scenario, the lessee is allowed a deduction of interest expense on an incurred basis. Principal repayment is not tax deductible but capital allowance in respect of the leased asset will be granted to the lessee. With the change to FRS 116, the lessee no longer has to perform the OL/FL classification. However, for tax purposes, IRAS continues to require the lessee’s tax preparer to assess whether the ROU asset meets the statutory definition of FL under Section 10D(3) of ITA. Specifically, paragraph 6.7 of the IRAS e-Tax Guide provides guidance that the lessee company can use the indicators provided in paragraphs 63 and 64 of the FRS 116/SFRS(I) 16 for lessor’s classification purpose to assess whether its lease arrangement is OL or FL. In addition, if it is an FL, the lessee’s tax preparer would have to consider whether it is regarded to be a sale agreement under Regulation 4(1) of Section 10D Regulations. Similar to the tax treatment under FRS 17, one of the three tax treatment scenarios explained in the preceding paragraphs has to be established by the lessee. Suppose Lessee Company Limited (LC) enters into a two-year lease for a piece of equipment with an annual lease payment of $11,524 made at the end of each year. The implicit interest rate and incremental borrowing rate is 10%. The ROU asset and the lease liability is measured at the present value of the two payments of $11,524 discounted at 10% per annum, which is $20,000. Under FRS 116, at the start of Year 1, LC will debit ROU Asset $20,000 and credit Lease Liability $20,000. At the end of Year 1, LC will debit interest expense $2,000 (10% of outstanding lease liability), debit lease liability $9,524 and credit cash $11,524. LC will also debit depreciation and credit accumulated depreciation of $10,000 (ROU asset depreciated over two years). The tax treatment and adjustments required for the first relevant year of assessment are summarised in Table 1. Note that the tax treatment and adjustments in tax computation for Scenarios 1 and 2 are in effect similar. Even though there is only a single lessee model post-FRS 116 for accounting purpose, IRAS still requires lessee entities to assess whether the lease is an OL or FL and if it is the latter, whether it is regarded as a sale agreement or not. Even though there are three potential tax treatment scenarios, the tax effects of scenarios 1 and 2 are similar. Koh Wei Chern is Associate Professor, and Tommy Yee Chun Tsian is Senior Lecturer, Accountancy Programme, School of Business, Singapore University of Social Sciences. 1 Paragraphs (a) to (e) are replicated here for ease of reference: (a) the lessee has an option to purchase the machinery or plant during the term of the lease including any extension or renewal thereof or upon its expiry; (b) the machinery or plant which is leased is a limited use asset; (c) the machinery or plant in a sale and lease-back transaction has been previously used by the lessee or any other person; (d) the lessor and lessee are related to each other, and (i) the lessee or any other person related to the lessee lends to the lessor any of the funds necessary to acquire the leased asset or guarantees any debt of the lessor incurred in connection with the lease; or the terms of the lease are determined otherwise than on the basis that there is no such relationship between the lessor and the lessee; or the total value of the rentals or hire received or receivable for the term of those finance leases entered into by the lessor with lessees, who are related to the lessor, at any time during the basis period for any year of assessment exceeds half of the total value of the rentals or hire received or receivable for the term of all finance leases entered into by the lessor in that basis period; or (e) the lease is a leveraged lease.